Posted on September 29, 2017, by & filed under Analysis, apartheid, Communities demolished, House Demolitions, House Demolitions, News. As the month of August began, Israeli forces wasted no time in their campaign of demolitions and the Judaisation of all of historic Palestine, and proceeded to demolish the Bedouin village of Al-Araqib in the Negev for the 116th time since 2010, and for the 8th time this year alone. 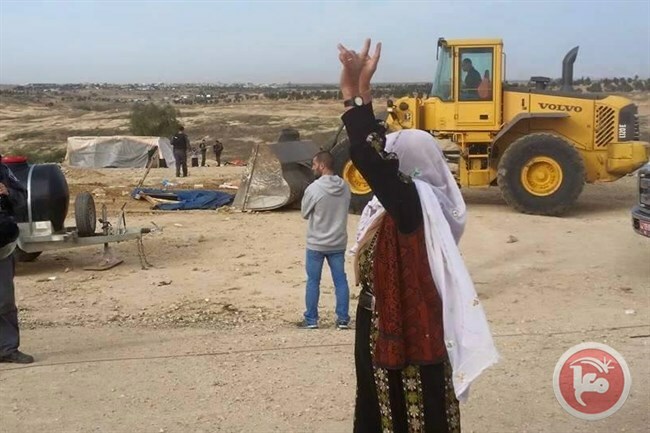 Misery continued for the Bedouin citizens of Israel, when 10 Bedouin dwellings were demolished the very next day in the village of Bir Hadaj, alongside 3 shigs — traditional Bedouin gathering places. A number of days later, on August 7th, a Bedouin man was forced to demolish his large storehouse in Um-Namila, north of Rahat in the Negev, in order to avoid paying the Israeli demolition costs. In line with the Israeli demolition trends of recent months, many houses in occupied East Jerusalem were also demolished this August. On August 8th, Israeli forces arrived unannounced at the home of the Shaludi family in the neighbourhood of Jabal al-Mukabbir, and coerced them into leaving the home with the majority of their possessions and furniture still inside in order for the demolition to take place. Following the demolition, the family of four are now homeless, including their paralysed eight-year-old daughter. The very same day, Israeli forces also demolished a home in the occupied East Jerusalem neighbourhood of Beit Hanina, which was recently built by Ismaeel Siyam as a family home for his newly married son. The eviction proceeded without any prior warning to the family, and Israeli forces also destroyed the family’s freshly planted garden. Many demolitions also occurred this August in the occupied West Bank, including areas partially under Palestinian control in Area B. On August 10th, three homes were punitively demolished in the village of Deir Abu Masha’l near Ramallah, as a form of collective punishment for the families of three youths who murdered an Israeli policewoman in June. Punitive demolitions and collective punishment are illegal according to international law and conventions for which Israel is signatory. Despite this, punitive demolitions of alleged attacker’s family homes are commonplace across the Occupied Palestinian Territory (OPT) and Israel. Also on August 10th, a home was demolished in Silwad, near Ramallah. Numerous demolitions of Palestinian homes took place on August 14th. In the occupied West Bank, in the village of Khashem al-Daraj near Hebron, two family homes donated by the European Union were demolished. In the Bedouin villages of Sawawin and Abu Tlul in the Negev, four homes were demolished, leaving many homeless. Only the next day, on August 15th, a further 3 demolitions took place in three neighbourhoods in occupied East Jerusalem. These included homes in the neighbourhoods of Silwan, Beit Hanina and Al Isawiya. The next day, on August 16th, the family home of the Palestinian man who murdered three Israeli settlers in the settlement of Halamish was demolished in the West Bank village al-Kobar. In addition to the fourth illegal punitive demolition of Palestinian homes this month alone, Israeli troops had also sealed off the entire village of al-Kobar since July 21st as a form of collective punishment for the attack. As August progressed, further demolitions took place, particularly targeting Bedouin citizens of Israel. On 17th August, a home in the Bedouin village of Umm Gabo, east of Tel-Sheva was demolished for the firth time. The same day in Wadi Guwain, south of Hura, a home, an animal pen, a canal, and a fence were destroyed by Israeli troops. Also on August 17th, a fence and a canal were destroyed in Al Bat, east of Hura. Demolitions of Bdouin homes continued, and on August 22nd, two homes were demolished Wadi Al Naam in the Negev. Further demolitions took place the same day in Hashem Zana, where one home was destroyed, Za’arura, where one home was demolished, Silwan in occupied East Jerusalem, where one home was demolished, and the Bedouin village of Al-Araqib which was demolished for the 117th time since 2010, and the second time this month alone. In order to increase the suffering of the residents of Al-Araqib, the Israeli state also ordered they pay tens of thousands of New Israeli Shekels (NIS) for the demolition costs of the last six demolitions. Further demolitions took place on 23rd August in Jubet adh Dhib near Bethlehem. The following week, on August 30th, four demolitions took place in the Negev, in Laqiya, Darjat, Hura and Wadi Rawan. The next day on August 31st a further demolition took place in Tublas, in occupied Jerusalem, where a Bedouin family home was demolished. In a concerning turn of events this August, the Israeli government began to focus on Palestinian and Bedouin schools for demolitions, claiming they lack the difficult to obtain Israeli building permits. In the few days before the start of the school year, on August 21st, the only nursery school serving children aged six and under in the Jabal Al Baba Bedouin community was demolished. In the Bedouin community of Abu Nuwar, in the occupied West Bank, children are also unable to start classes due to the confiscation of their school’s solar panels and only form of electricity on August 22nd. Also on August 22nd, the day before school was due to the start, the newly built sole primary school in the West Bank village of Jubbet Al Dhib was demolished. Despite the school and building supplies being donated by a number of European countries including Belgium, Israeli troops demolished the school after only serving the demolition notice late the night before, leaving no time for anyone in the international community to intervene. The destruction of the school not only infringes upon the Bedouin children’s basic right to education, but also leaves them vulnerable to violence. The nearest school to the community is now a 10km walk away, passing many illegal Israeli settlements and leaving children open to attacks from illegal settlers, which are commonplace. Education is a basic right for all children, write to your local MP and tell them Israel cannot be allowed to continue targeting schools and denying Palestinian children the right to education.